Have you ever wondered, as a massive freight train lumbers overhead when you are crossing the Mississippi on the Government Bridge why that train is above rather than beneath you? The answer: So the train won’t scare the horses. Warm summer days can be wonderful, but there’s at least one downside for many Quad-Citians. 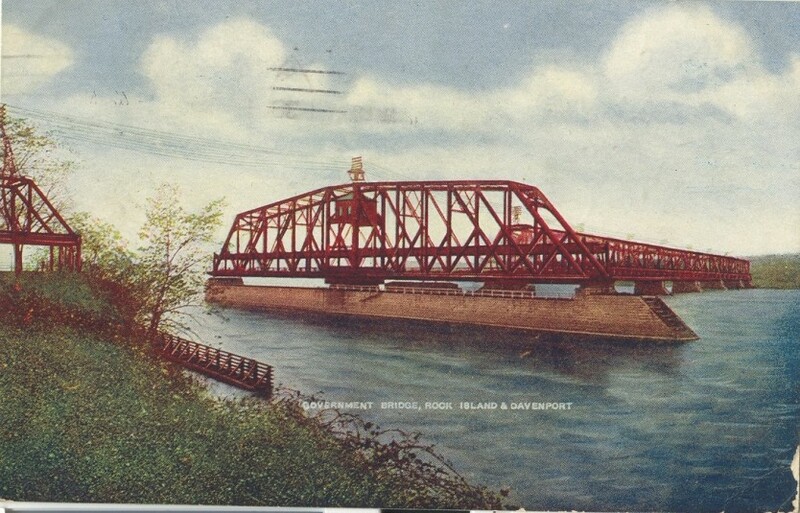 The absence of river ice means the navigational season is on and the Government Bridge opens to water traffic and closes to land travel, as illustrated on our postcard today. Although our response is often annoyance, we can learn from visitors and newcomers, who use that delay to enjoy the open bridge and observe its workings from a front row seat. Our Quad City region has been and continues to be shaped by its bridges. And the Government Bridge from Arsenal Island to Davenport has been around longer than the any of the others. Although a great hullabaloo greeted the first railroad that reached the Mississippi in Rock Island in 1854, the completion of the first bridge, designed for railroads only, across the river here in 1856 was of even more significance. That bridge was a gateway, opening the western half of the country, starting with Davenport, to exponential growth. That bridge was built of wood and iron and was located just upriver of the current Government Bridge. Two weeks after opening, it was struck by steamer Effie Afton and partially destroyed. The destruction was complicated by heavy winds a few weeks later that knocked the drawspan into the river. Although it was eventually repaired, in 1865 it was replaced by a sturdier bridge at the same location. Yet history repeated itself: Shortly after opening, that second bridge was damaged when a steamboat collided with it. After the Civil War, when the federal government took over Arsenal Island, Brig. Gen. Thomas Rodman drafted plans for a new bridge at the western end of the island. That bridge was intended to meet the needs of the railroads while freeing the interior of the island for arsenal development. In authorizing the new bridge, Congress specified that the government and the railroad would share costs, with the government paying no more than $1 million. Gen. Rodman’s original bridge allowed for railroad tracks above a “wagonway.” That arrangement was debated, with many asking for the railroad portion of the bridge on the lower level and the wagonway located above. As stated above, the argument was resolved when skittish horses were considered. A side benefit of the configuration was easier alignment with Davenport streets. The wagonway was 30 feet above low water with the railroad track twelve feet above that. The bridge was completed in 1872, built of iron with a wood deck like its predecessors. Although its five spans were 220 to 260 feet in length and the pivoting draw span was 366 feet long, the bridge was only 16 feet wide, narrow even for two-way wagon traffic. In contrast to today’s bridge, it was delicate and lacy in appearance. As trains became larger and heavier, the 1872 bridge became inadequate. In 1895, work began on a stronger and larger bridge. Engineer Ralph Modjeski of Chicago was just beginning his career when he designed the all steel bridge and then supervised its construction for the Chicago, Rock Island and Pacific Railroad and the US Army Ordnance Department. The bridge we see today was completed in 1896 at a cost of about half a million dollars. This brand new Government Bridge was built on the piers of the 1872 bridge. The new drawspan, capable of rotating a full circle, is still unique. Trolley tracks that were installed on the traffic deck after the bridge was complete were removed around 1940. This postcard, mailed in 1909, shows the bridge unchanged and with a remarkably uncluttered background. Both Lock and Dam No. 15, which was completed 1934, and the Centennial Bridge, which opened in 1940, are absent. Ralph Modjeski, the bridge designer is of great importance, both nationally and in the Quad Cities. He was born in Poland and came to the United States in 1876, at the age of 15. Although his original intent was to be a concert pianist, he used his artistic talents as a bridge engineer and designer instead. His bridges, which have been termed “characteristically American,” encompassed two distinct eras – the old steel truss-style railroad bridge and the new modern suspension bridge. His masterwork is considered to be the 1926 suspension bridge over the Delaware River in Philadelphia, at the time the longest suspension bridge in the world. He also designed another magnificent suspension bridge in 1933, the Moline to Bettendorf Veterans Memorial Bridge. It is now the endangered I-74 bridge. After Modjeski’s 1940 death, the New York Times called him “America’s greatest bridge builder.” The Government Bridge is a wonderful example of how continued maintenance can keep historic bridges useful, despite heavy (figuratively and literally in this case) use for over a century. Don’t dismay if you run into an open bridge this summer. Just relax and enjoy Modjeski’s artistic and functional design. This article by Diane Oestreich is slightly modified from the original, which appeared in the Rock Island Argus and Moline Dispatch on July 3, 2005.